Do you wonder where all your money goes every month? Mint.com offers FREE financial money management software that helps you budget and manage your money. It sounds like something that will definitely help my family on our journey to becoming debt free. 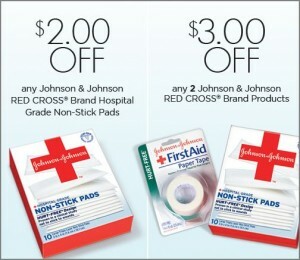 Go here to print a coupon for $3/2 Johnson & Johnson Red Cross products. You can often find these products in trial sizes for $0.99. I see FREE products and overage in our future! I got my second check for $14.00 from Opinion Outpost yesterday. I earned that by taking surveys. I started May 26th and I do a couple of surveys a week. I have received a total of $33.70 – earned in less than 6 weeks. You need 50 points (equates to $5.00) to request a check. I already have another $6.00 built up. That means I could request another check – but I am waiting for a larger balance before I request it. I usually take the surveys while I am watching TV in the evening. If you are interested in doing surveys from a company that pays quickly and has multiple opportunities for earning, go here to learn more. I highly recommend them. You won’t get rich but just imagine what you could buy at CVS with $33.70! I love to eat out but I don’t love paying full price! Restaurant.com is selling gift certificates to restaurants all over the United States at 70% off through July 15th. You can buy a gift certificate that is worth $25.00 for only $3.00. Wow! Click on the above link to check out the restaurants in your area that accept the gift certificates and to purchase yours now. Use the code FRESH to get the full discount. These kind of work like coupons. Each restaurant is different. Make sure you read the requirements for each restaurant. My friend Jeana from Crazy Coupon Mommy has entered her son, Whistler, in Gerber’s Generations Photo Contest. He could win a $25,000 college scholarship and be featured in a Gerber baby ad. She needs your help. In order to win, Whistler needs to get the most votes. Right now he is a little behind. It’s simple to vote. Simply click on the this link and then click on vote for me. He is really cute – wait until you see his photo. 🙂 You can vote for him once per day. Jeana is also giving away a $50.00 Amazon.com gift card to someone who votes for Whistler. Go here to read more about it and enter for yourself. Ebates is still offering a bonus when you sign up. Now they are offering $5.00 cash back or a $10.00 gift card when you sign up. Any time I buy something online, I go through ShopAtHome or eBates. Both companies give me money back on my purchases in the form of a rebate. eBates is running a special promotion for customers. That’s in addition to any percentage cash back offered by an online store. I have received $104.23 in cash back plus a $5.00 Target gift card from them since joining. I highly recommend this company. Go here to sign up with them. Cellfire has released some new coupons. Go here to load them to your shopper’s card. Save $0.50 when you buy 40 OZ. OR LARGER Original Bisquick® OR Bisquick Heart Smart® Baking Mix. Save $0.75 when you buy TWO BOXES any flavor Betty Crocker® Box Supreme Brownie Mixes.